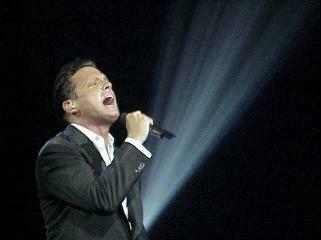 This Fan Page has links to photographs of Luis Miguel. Luis Miguel is a Mexican ballad singer and Pop star. Here you will find photographs of Luis Miguel playing at the Radio City Music Hall in new York City on April 19th, 2000. The show was amazing with gorgeous back up singers doing sublet choreography and huge projections of the concert behind the musicians. To read more and to see the pictures click here. These photographs were taken by Juan Fernando Lamadrid. All rights reserved and copyright www.justsalsa.com. Your feedback is welcome. "Click" on Thumbnails to See Index of Photographs!